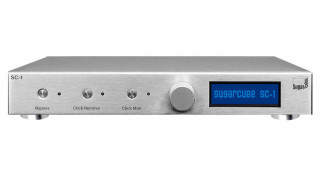 SugarCube SC-1 vinyl noise remover hits the UK | What Hi-Fi? Say goodbye to the snap, crackle and pop of old vinyl (if you can afford to). For some vinyl enthusiasts, the surface noise of vinyl records is as endearing as the actions of pulling a disc from its sleeve or lowering a turntable’s tonearm lever. But of course one can have too much of a good thing, and the sound of a worn record can fall into that category. And if a good ol’ clean can’t help, maybe the SugarCube SC-1 can. Designed for people with older or second-hand record collections, the all-in-one noise removal device uses proprietary ‘click & pop’ removal technology by Silicon Valley-based start-up SweetVinyl to eliminate vinyl noise in real-time. The technology supposedly uses an algorithm to detect, isolate and remove unwanted noise while keeping the music signal unharmed. All owners have to do is hook the SC-1 up to a phono stage, press a button to initiate the clean-up process, and turn a dial to adjust the strength of the process. When the supplied USB key is plugged into the SC-1, the process can be initiated and controlled via SweetVinyl's SugarCube app for iOS and Android devices. We first saw the SC-1 on Indiegogo back in 2016 and, while a small number were demonstrated in the UK last year, it is finally available to buy in the UK - in black or silver finishes. The damage, as it were? £1550. We bet the clicks and pops seem even more endearing now.